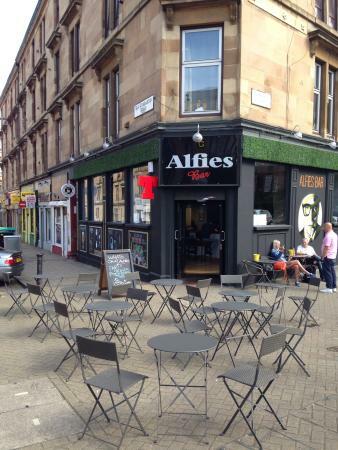 Alfies Bar (@AlfiesBar) has kindly agreed to sponsor the Glasgow Guardian Sport’s monthly competition. It is easy and free to enter and there are several great prizes to be won. Alfies Bar has brought back the concept of a traditional student bar, with amazing prizes, comfortable surroundings and – best of all – no bams! There is a wide and varied selection of craft beers brewed in Scotland and, if you can find Wally on the Where’s Wally wall, a free shot for you. Alfies Bar, 67 Old Dumbarton Road, G3 8RF. Next to Yorkhill Hospital, just off Argyle Street. So, if you fancy eating out for cheap or you want to have fun on FIFA night – yes, a FIFA tournament in a pub – then Alfies is the place to be. All of the big matches are available to watch too. Show your student card and get: bottles from £2, draughts from £2.80, shots from £1 and spirits from £1.50. How about 6 shots for £4 and 6 bombs for £5? Alfies is now offering traditional Chinese cuisine (tapas-style) at a student-friendly price. What are you waiting for? This month’s competition was to predict the time of the first goal in the Old Firm game on 1st February. Congratulations to Sarah Isles, who correctly said that the deadlock would be broken after 10 minutes. She has won a meal for four with two cocktail pitchers. Names were drawn at random for the remaining prizes. Winning the student first aid kit was Shannon Lloyd, while free venue hire went to Tom. Finally, Gianluca can expect to receive a free shot/pint at the bar! Thanks to all for entering, and tune in next time for more great prizes and fun!